A few weeks back I wrote this essay for BreachBangClear. In the essay, I discussed something that seems pretty obvious to me and a lot of other vets: many veterans are using fake PTSD claims to milk the system for a free monthly handout. That makes it harder for veterans with legitimate problems to get help. The essay generated plenty of intelligent responses in agreement or disagreement, a few “what the hell is he talking about” comments, and a good number of pretty funny personal insults. So I wrote a follow up essay, to address the response. BreachBangClear published it on February 26th. “Not surprisingly, my essay PTSD: fakers and frauds and WTAF? generated hundreds of comments from angry, supportive, incredulous or head-nodding-in-agreement readers. Many veterans shared anecdotal evidence of other servicemembers who claimed PTSD for what appeared to be trivial things (for example, seeing a destroyed vehicle from a car bomb attack that happened a week earlier, or hearing a report of a possible sniper while on a convoy). In fact, if I recall correctly, of the many readers who agreed with me, only three weren’t veterans. Of course, many people took exception to what I wrote. Quite a few thought my essay was insulting to non-combat troops. Some readers took my post to mean I don’t believe “fobbits” (a term I didn’t use in my essay) can get PTSD, or that people with PTSD shouldn’t get help. I objectively did not write those things, but the tone of my post apparently conveyed those messages to certain people. Hmph. I thought your article was great and incisively tore into the entitlement-heavy, risk-free, duty-less mindset that pervades much of the United States. I found it balanced and VERY fair. Oh, and add me to the list of of non-veteran supporters. Soldiers aren’t the only ones to encounter stuff that could cause legitimate PTSD. I know the smell of burning flesh from my work as a volunteer firefighter. I’ve seen death and destruction up close and personal. But it wouldn’t bother me if others quit after a bad call or needed help. But what some of these soldiers are doing (“I thought I heard a sniper”) would be akin to seeing a torn up car on the freeway from a distance and then being traumatized over the theoretical pain and suffering of the occupants and demanding treatment and benefits for life. Thankfully, we can’t afford to enable that kind of behavior with our budget. A lot of people just need to grow up, accept the risks and hardships of life, and learn to handle some of those disturbing and traumatizing events they experience. It’s life. And for the truly horrific stuff, yeah, get help. But I’d posit that a good Church and faith is better for that than Uncle Sam and money, but I could be biased. Keep up the good work, don’t let the haters get you down, and stay safe. Thanks j. Your comment reminds me of something that happened almost 20 years ago. I was on an accident scene where 4 innocent people were killed by a drunk, legally blind ex-con who passed out and drove onto the wrong side of a highway. The sergeant who was investigating it got a call a few days later from a man who said he and his wife had driven past the accident. The sergeant thought they were witnesses, but then the man explained that his wife had been in a car wreck in the past and had a panic attack when they passed the accident scene I was on. He then asked if anyone involved had insurance. He was actually just after a payment, because his wife had been “traumatized”. Thanks for the comment, and stay safe. I told my wife recently that if I’m ever successful enough as a writer I want to retire, write full time, and be a volunteer firefighter and EMT. …and as much as I should be honored that your retirement goals reflect my career path, Chris Hernandez is my hero. I agree that many milk the system but I cannot speak for today’s veterans; my war was many years ago. I noticed that the people around me changed; some went from being rather mild to very intense “crazy so to speak” some got religion, some lost their nerve; they just knew the next time they took point that was it and especially when they got short. Some seemed to have no affect at all, one guy was wounded on four different occasions, he was shot up everywhere, this torso looked like a city map with all the scars. That guy acted like it was all nothing. Who knows for sure who will do what but I definitely agree that there are tons of fakers. As far as this post goes it’s amazing how some people just don’t get things when it’s on paper; they miss the point, grab segments and go off half cocked thinking they got it. I would say if you got a response then you did your job well; at least you got people to do something even if it was wrong, lol. Chris I just left a comment and I wasn’t going to say this but perhaps it’s better if I get it off my chest. Some people, like you just don’t feel fear the same way as many people do. One thing I gathered from the original post is that only a small percentage of troops could possibly become debilitated from actual PTSD. From your perspective what you said is absolutely true; but you’re not the entire sample of soldiers but rather the acceptation. A lot of veterans have had enough action but some go on to be police officers and stay in the action so to speak. Though I agreed with you to a point I think your earlier blog was a bit cut and dried leaving little to no margin for other possibilities. Perhaps if you leave things a little more open next time you won’t need a flack jacket. Look up psychopathic personality traits in non criminal persons. Do some research in this area then look around at your cop buddies, fireman and other high risk occupations, yup, you’ll see a lot of guys who function well in society but don’t have the same fear factor as most people do. These guys are less affected and may see others who are affected as sissies or fakers. LOL, not saying you’re a psycho, just saying many have over lapping traits which make them different than most men. Not saying I’m right but maybe so….maybe not. I understand your point, and I agree that I was a little better prepared for combat because of my LE background. I don’t think I felt less fear, I was just used to it. However, for some reason there seems to be a belief now that simply being scared means someone should have PTSD. I don’t see how. Being scared is part of the experience of being a soldier at war; it’s to be expected. When I was in Iraq I felt a LOT of fear, because we were completely at the enemy’s mercy. 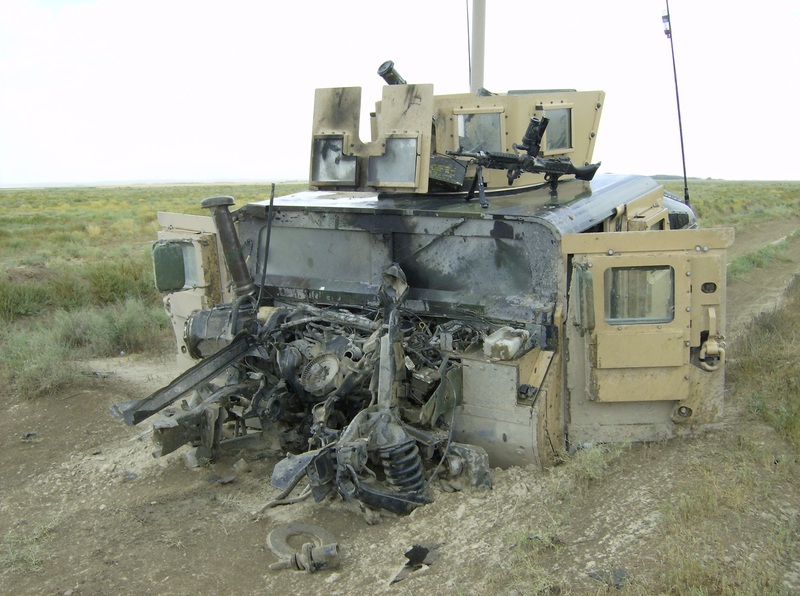 If the insurgents picked us out for an IED strike, there was nothing we could do to stop it (or at least, that’s how it felt). And that fear had an effect when I came home. But it wasn’t PTSD. My argument is with PTSD claims resulting from what seem to be unreasonable justifications. For example, seeing a distant IED detonation but not experiencing anything else (like encountering casualties). I agree, it truly seems there is no justification in many cases and most likely in a large percentage of cases. There are many who have no personal sense of making it on their own and the system is taxed due to these lazy fakers. The thing about Iraq or Afghanistan is there is no clear enemy unless you’re being ambushed. The enemy hides among the masses and you never know when or where you’ll be hit. The unknowing is a scary thing as a soldier can never be truly being the lines and in a safe zone; we’ll unless it’s camp leatherneck but even there you can see some problems but less likely. PTSD is very serious when severe, but the VA does NOT consider anyone disabled just because they were diagnosed with PTSD. That in itself is NOT a disability. For one traumatic event, I don’t think they would ever give someone disability for that, probably just treatment to get better. I think there a lot of rumors out there. You must have severe problems to be disabled with PTSD. I don’t think it can be faked. Doctors are not dumb. There just isn’t a way to do that. But I think most doctors know that one event can be enough to have symptoms, but not enough to be permanently disabled. They may have let up requirements for a diagnosis, but the requirements for disability are the same. There are things they look for, beyond anything anyone can fake. A certain predictable percentage of denizens of Teh Internetz don’t read what other people actually write, because comprehension gets in the way of their preferred rant. Forgive me if I can’t screw up the sympathy to feel for guys and girls that “suffered” without ever leaving a FOB. I guess I am one of your mindless head bobbers. Sidenote: Pops thoroughly enjoyed the paperback edition of “Proof Of Our Resolve”. It’s possible for people to suffer without leaving the FOB, but there has to be some traumatic event; I sure as hell wouldn’t fault anyone who lived through a rocket attack for having PTSD. But the guys who didn’t experience anything like that, and also never left the wire? How do you get PTSD from that? Thanks, and please tell your father thank you for me. Both for reading, and for his service. We both know there are fakers working the system. Haters hate but the TRUTH shall set us free! Keep up the good work! Your paperback is out? I’m headed to Barnes and Noble right now! It’s not available in all B&Ns yet, but it’s been in a few and we hope to have it nationwide before too long. It is available for order at B&N though. I got to admit, if your goal is raise awareness and generate eyeballs, you have a talent for it. Chris, I see you received some prompt sympathy for being compared to Piers Bloody Morgan. This Brit sees at once what a low blow that was. Please don’t remind me, my therapist has almost convinced me that I’m still a worthwhile human being even though someone said I’m like Morgan! Thanks for the comment, and might I add that I really enjoyed my trips to England and the time I spent working with British soldiers and police officers. Chris, you are an incredible writer. You speak the truth, from a VA employee who questions why so many veterans suffer from PTSD, veterans who were never even near combat, Actually I do not need to question why, I know why $$$ and the fact anyone can get a diagnosis of PTSD. These give away diagnoses are a slap in the face to those who truly experienced the atrocities of war and truly suffer from PTSD. If there were no $$ compensation being paid by the VA and only treatment provided, there would be huge decrease in the DX of PTSD. VA employees are not allowed to question a diagnosis linked to ones military service no matter how ridiculous the diagnosis and the rational. The VA disability compensation system is broken and not because it pays to little to veterans but the fact that VA has taken the common sense factor out of the claims process and pays veterans for every ache and pain they claim ever occurred in service..and I am not referring to combat veterans. The system is broke and once we run out of $$ for those truly deserving will the system be fixed. This administration doesn’t want to hear the truth…they believe every veteran is a hero which is far from the truth and again a slap in the face to the true heroes. This generation of soldiers is such a me me you owe me generation, I am entitled; and this administration feeds on this entitlement mentality. It is very disturbing. Thanks Nicki. I think the central point we both make is, “If people didn’t makes money off PTSD claims, there wouldn’t be nearly so many claims”. I also agree that not every vet is a hero, and we shouldn’t be treated as such. True heroes are few and far between. I also will mention this, There are veterans out there that flat out NOT talk to the VA about PTSD because if they do, they are on a list and have to worry about the cops showing up and seizing their privately owned firearms. I am a veteran from the first Gulf war and when I came back, I had rage issues and many other things, and it took years and a good wife to help me get my head on straight. Even now when I talk to the VA about anything I DO not mention PTSD. Keep on doing what you do, you are good at it. and I enjoyed your book “Line in the valley”, it actually is to me a realistic possibility with the issues with the border. I’ve heard a LOT of vets say the same thing, that we’re going to have problems with the government trying to disarm vets diagnosed with PTSD. Hopefully they never try it, because it won’t turn out like they want it to. And thanks for reading Line in the Valley. Did you happen to drop a review on Amazon? This article show clearly that this author is a hack for the current Zionist -Occupied U.S government. Do they pay that well? But maybe you’re Mexican originally and never really cared for America anyway? Pathetic…to the U.S veterans who read this crap..I apologize for this crude, anti-American hack..
That shows how much you know. We Mexican Zionists are called “Zionistas” and are trying to establish a state called “Israelo”. We had planned to finance the Zionista movement by selling kosher tacos, but then we ran into another snag. It turns out yarmulkes are totally inappropriate for dancing the traditional Mexican Hat Dance. We’d only get through “La Cucaracha, la Cuca-” before we’d run out of hat. We Zionistas were crushed, our plans were foiled. We could have gotten away with it, if it wasn’t for you meddling truthers! But seriously folks, Stevie is a conspiracy theorist. He commented here because my essay refuting a Sandy Hook “truther” pissed him off so bad. He didn’t have any cogent arguments to make, so he started with the “Zionist! Hack! Paid shill!” nonsense that truthers keep in their back pocket for anyone who disagrees with them. I could have just deleted the comment, but I wanted Stevie to remind everyone what a “truther” is. …I…. can’t breath…. laughing so hard at this!!!! Stevie…. I’m going to go out on a limb and label you as a “social retard”. I don’t think you will find a definition on Google, but it probably stems from your insecurities of being the last one picked to play touch football.